When a severe heat wave strikes, the aliens cut off the city's water supply and exploit a local reverend to drive humans into worshipping the Morthren Eternal. Contest: Win War Of The Worlds: Goliath on Blu-ray + Signed Artbook! A Canadian-produced anthology series scripted by famed science-fiction author Ray Bradbury. Many of the teleplays were based upon Bradbury's novels and short stories. Quinn: To Life Immortal... sucker. Q: What are the differences between seasons 1 and 2? 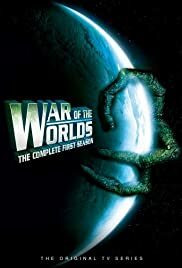 The first season of War of the Worlds was groundbreaking and refreshingly innovative. In many ways, it was the predecessor of shows like "The X-Files". The first season was very much like a game of chess between the Blackwood Project and the aliens- led the triumvirate Advocacy (featuring the underrated actress, Ilse Von Glatz- who was chilling as an Advocate). Towards the end of the season, there was a mythology carefully being built with the introductions of new characters such as the renegade alien/human hybrid- Quinn and the Qar'To Synth, Katara. Also, the show was blessed with creative writing, excellent direction- and casting Ann Robinson as Sylvia Van Buren was a nice coup for the producers. However, Paramount had plans to assassinate the show and installed Frank Mancuso Jr. as the new executive producer. He obliterated the first season storyline, continuity, most of the characters and killed the show in the process. But to many fans, the only real season of WOTW was 1988-1989.